Many people have difficulty believing that Jesus, who appeared as a man; that is, He was born, grew up as a child, and worked as a carpenter, could be Almighty God. John 1:18 No one has ever seen God, but God the One and Only, who is at the Father's side, has made him known. Col 2:9-10 For in Christ all the fullness of the Deity lives in bodily form, and you have been given fullness in Christ, who is the head over every power and authority. Jesus Christ is the bodily form of God, who is the Father, Son, and Holy Spirit. He made us in His image—soul, body, and spirit. It took supernatural humility for Jesus to humble Himself, leave the glory of heaven, and live a life like one of His Creation. Not only that, but Jesus became obedient to those He created, as well as to the Father in Heaven. This obedience shows His love for the Father and for us. This love led Him to the Cross and prevented Him from using His almighty power to stop the suffering He endured for our salvation. John 14:5-11 Thomas said to him, "Lord, we don't know where you are going, so how can we know the way?" Jesus answered, "I am the way and the truth and the life. No one comes to the Father except through me. If you really knew me, you would know my Father as well. From now on, you do know him and have seen him." Philip said, "Lord, show us the Father and that will be enough for us." Jesus answered: "Don't you know me, Philip, even after I have been among you such a long time? Anyone who has seen me has seen the Father. How can you say, 'Show us the Father'? Don't you believe that I am in the Father, and that the Father is in me? The words I say to you are not just my own. Rather, it is the Father, living in me, who is doing his work. Believe me when I say that I am in the Father and the Father is in me; or at least believe on the evidence of the miracles themselves. Since the Father, Son, and Holy Spirit are one, the attributes, which can only be attributed to God, are also the attributes of Jesus Christ. 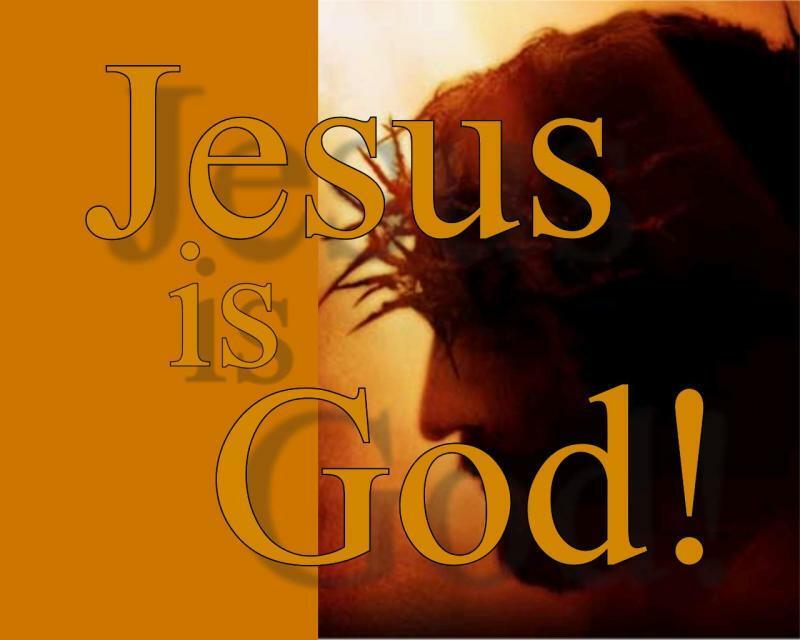 John 1:1-3, 10 In the beginning was the Word, and the Word was with God, and the Word was God. He was with God in the beginning. Through him all things were made; without him nothing was made that has been made. He was in the world, and though the world was made through him, the world did not recognize him. Col 1:15-17 He is the image of the invisible God, the firstborn over all creation. For by him all things were created: things in heaven and on earth, visible and invisible, whether thrones or powers or rulers or authorities; all things were created by him and for him. He is before all things, and in him all things hold together. Jesus, the Son of God, the image of God, was instrumental in creation. God created the world and everything was made through the Son. Just as God created the world through Him, the Son is able to create His own image in anyone and everyone who asks Him to do so. John 8:56-59 Your father Abraham rejoiced at the thought of seeing my day; he saw it and was glad." "You are not yet fifty years old," the Jews said to him, "and you have seen Abraham!" "I tell you the truth," Jesus answered, "before Abraham was born, I am!" At this, they picked up stones to stone him, but Jesus hid himself, slipping away from the temple grounds. Rev 1:7-8 Look, he is coming with the clouds, and every eye will see him, even those who pierced him; and all the peoples of the earth will mourn because of him. So shall it be! Amen. "I am the Alpha and the Omega," says the Lord God, "who is, and who was, and who is to come, the Almighty." Rev 1:17-18 When I saw him, I fell at his feet as though dead. Then he placed his right hand on me and said: "Do not be afraid. I am the First and the Last. I am the Living One; I was dead, and behold I am alive for ever and ever! And I hold the keys of death and Hades. Eternal life is not a gift from God, eternal life is the gift of God. Eternal Life has little to do with time; eternal life is the life of Jesus. It has no beginning or end. Death has no power over eternal life. Jesus said, (John 11:25) “I am the resurrection and the life. He who believes in Me, though he may die, he shall live.” The only source of eternal life is the Lord Jesus Christ. Jesus said, (John 10:10) “I have come that they may have life and have it to the full.” When Jesus lives in us, we have eternal life here, now, and forever. Without Him, we are filled with death and hopelessness. Jesus, as to his divine nature, is everywhere (omnipresent). Matt 18:20 “For where two or three come together in my name, there am I with them." Matt 28:18-20 Then Jesus came to them and said, "All authority in heaven and on earth has been given to me. Therefore go and make disciples of all nations, baptizing them in the name of the Father and of the Son and of the Holy Spirit, and teaching them to obey everything I have commanded you. And surely I am with you always, to the very end of the age."" The reality of Jesus’ presence is not dependent on any place. Our problems come when we fail to acknowledge the reality of His presence, and so we disobey Him. Our duty is to see that there is nothing between Jesus and us; that nothing prevents us from acknowledging His presence. Jesus Christ is all-knowing (omniscient). Matt 9:3-4 At this, some of the teachers of the law said to themselves, "This fellow is blaspheming!" Knowing their thoughts, Jesus said, "Why do you entertain evil thoughts in your hearts? Luke 9:46-48 An argument started among the disciples as to which of them would be the greatest. Jesus, knowing their thoughts, took a little child and had him stand beside him. Then he said to them, "Whoever welcomes this little child in my name welcomes me; and whoever welcomes me welcomes the one who sent me. For he who is least among you all-- he is the greatest." John 13:38 Then Jesus answered, "Will you really lay down your life for me? I tell you the truth, before the rooster crows, you will disown me three times! Jesus doesn’t merely know what we think; He understands what we think. He knows the hidden motives and agendas that stand behind our thought processes. He knows our every thought and emotion, every decision we must make, and problem we are going through. This fact may give us some fear; however, an ignorant God with absolute power to do anything He wanted would be more frightening. We would constantly fear that He would use that power in ignorance of the truth. He might not know who was truly guilty of sin, or He might perform a miracle which, because of ignorance, produces something monstrous. Therefore, knowing Jesus is omniscient should both evoke praise and bring comfort to believers. Because He knows, understands, loves, and corrects us, we have His peace, knowing He is in full control of everything and is able to present us spotless before the throne of God. Jesus Christ is all-powerful (omnipotent). Heb 1:3 The Son is the radiance of God's glory and the exact representation of his being, sustaining all things by his powerful word. After he had provided purification for sins, he sat down at the right hand of the Majesty in heaven. Phil 3:20-21 But our citizenship is in heaven. And we eagerly await a Savior from there, the Lord Jesus Christ, who, by the power that enables him to bring everything under his control, will transform our lowly bodies so that they will be like his glorious body. That is where our salvation abides in its perfect security. Jesus Christ has full absolute power. He can do anything for any human being in keeping with His own character and purpose. He even has power over death. In Christ, we have eternal life and will inherit a glorified body like His. Jesus Christ is unchanging (immutable). Heb 13:8 Jesus Christ is the same yesterday and today and forever. This implies that Jesus’ character and eternal purposes do not change, which gives a solid foundation for our faith and hope. We can depend on Him. Jesus is unchanging in his being, perfections, purposes, and promises. Jesus can always be trusted because He always keeps his word. There never will come a time when Jesus will cease to be. All that He is today, He has always been, and always will be. He can’t change for the better, because He is already perfect. Since He’s already perfect, He can’t change for the worse. He is completely unaffected by anything outside of Himself. Acts 10:41-43 He was not seen by all the people, but by witnesses whom God had already chosen--by us who ate and drank with him after he rose from the dead. He commanded us to preach to the people and to testify that he is the one whom God appointed as judge of the living and the dead. All the prophets testify about him that everyone who believes in him receives forgiveness of sins through his name." 2 Cor 5:9-10 So we make it our goal to please him, whether we are at home in the body or away from it. For we must all appear before the judgment seat of Christ, that each one may receive what is due him for the things done while in the body, whether good or bad. John 15:13 Greater love has no one than this, that he lay down his life for his friends. Rom 5:7-8 Very rarely will anyone die for a righteous man, though for a good man someone might possibly dare to die. But God demonstrates his own love for us in this: While we were still sinners, Christ died for us. This is the Gospel Jesus Christ has commissioned us to preach: that this same sovereign judge, this Almighty God, has given His life so that men do not have to suffer the penalty of their sin. 2 Tim 4:1-5 In the presence of God and of Christ Jesus, who will judge the living and the dead, and in view of his appearing and his kingdom, I give you this charge: Preach the Word; be prepared in season and out of season; correct, rebuke and encourage-- with great patience and careful instruction. For the time will come when men will not put up with sound doctrine. Instead, to suit their own desires, they will gather around them a great number of teachers to say what their itching ears want to hear. They will turn their ears away from the truth and turn aside to myths. But you, keep your head in all situations, endure hardship, do the work of an evangelist, discharge all the duties of your ministry. The danger today is to make social and political work the emphasis of our ministry for Christ. All the intense social work and aggressive movements of our day are apt to be anti-Christ. They tend to be so, because they are based on the idea that human wisdom and effort are going to create the Kingdom of God. Therefore, Jesus Christ is de-emphasized as God and the Gospel is not preached. Again, we do good things, but Jesus is not preached. The key to our missionary/evangelistic efforts is the fact that Jesus Christ is God. We must emphasize who He is and what He has done for mankind. However, we cannot tell others about someone we don’t know. We must have an intimate relationship with Him and feed our soul (i.e. our mind, will, and emotions) on His Word. It is not sufficient for someone else to tell us about Jesus; we must perceive, with our own spirit, Who He is; we must know Him for ourselves. Then we can tell others about Him. We are a church, a part of the Body of Christ, but we are not to preach about ourselves. The only reason to invite unbelievers to church is to help them meet Jesus. This is not a social club or a humanitarian aid society. If they will not come to this church gathering, we are to make sure they meet Jesus through us. After they know Him, they will have a desire to gather with the rest of His body for fellowship, encouragement, and worship. I pray you realize Jesus is God today. If you have not made Him your Lord and Savior, today is the day of your salvation. Come forward to declare that Jesus is the Son of God, to repent of your sin, and give your life to Him through baptism. Jesus will give you His Life, the Holy Spirit, and you will experience His joy, peace, and forgiveness.